This tutorial discusses the working on web hosting server. In this article we will explain you the working of Web Hosting service. We will explain you How Web Hosting works? Web hosting is very important for e-commerce and it requires lot of technical work to make a server live 24x7. People around the world are using Internet to access Email, News, Entertainment, E-commerce, Informational, Educationally and many such websites 24x7. So, its very import for the web hosting companies to provide 99.9% server uptime. There are many websites on Internet and it is increasing day by day. Some websites are just developed personal use while others for business & institutes. Individuals and business are running many complex web portals such as News, Banking, gaming, Social networking etc. The performance and reliability of web hosting services are very important for such business. Web hosting companies are using latest servers, OS, softwares and data center management techniques to run and maintain web hosting servers. The main goad of web hosting is to provide web space to publish and run website on Internet. Web hosting service enables the clients to publish information on Internet for public access. The Web hosting service keeps the server 24x7x365 days live. Web hosting companies work round the clock to keep the server up and running. If there is some issue with server, they diagnose the issue to keep the server live and running. When user types website address such http://www.devmanuals.com, web browser finds the IP address domain through DNS lookup. Then it sends a request on http server at port 80. If server is running it sends the request pages on the browser. Browser then displays the content to the user. If there is image and other media associated with that web page, it also downloads and display/play it for user. Here server plays very important role, it hosts all the files on the server hard disk. When user request for some resource on server the Apache server running on the server servers the content. Above diagram shows the working of hosting server. Step 1: User sends the request to a server for some page. Step 2: The web server receives the requests and finds the file on the server. Step 3: We server serves the the file to the user if it is existing. If resource is not available it sends the appropriate error message to browser. Step 4: Finally web browser display the content to the user if request was successful. In case of some error browser displays appropriate error message to the user. 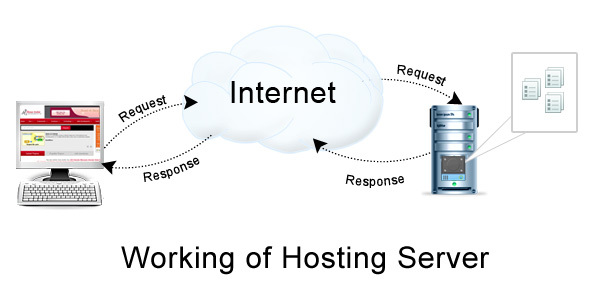 In this article we discussed the working of web hosting server.